This chapter explains Mobile Phone Dead Problem and Solution –How to Repair a Dead Mobile Cell Phone. These problem and solution apply to all brands and make of mobile phones including Nokia, Samsung, iPhone, China Mobile Phones, Motorola, HTC, Sony, Blackberry, Alcatel, Apple, AudioVox, Benefone, Danger, FIC, Hagenuk, Palm, Kyocera, LG, Panasonic, Huawei, ZTE, Spice, Lava, Sony Ericsson, Micromax etc. What is a Dead Mobile Cell Phone? A Dead mobile phone is a hand set that does not get switched ON. 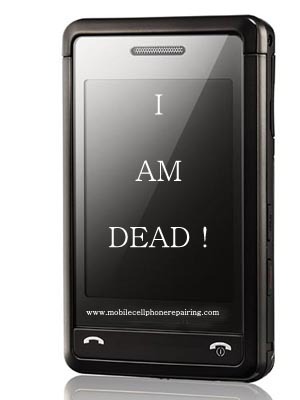 How Does a Mobile Cell Phone Gets Dead? If the mobile phone gets dropped down on the floor or on some hard surface. If the mobile phone gets wet or is dropped in rain or water. Remove the battery and see if it gets charged or not. Check voltage using a Multimeter. Voltage must be above 3.7 Volt. Use a Battery Booster to Boost the Power of the Battery and Charge it again. Check Battery Point and Battery Connector. Clean Battery Point and Battery Connector to remove any carbon deposits. Resold or change the Battery Connector. Insert charger and se if the “Battery Charging” appears on not. If there is icon of “Battery Charging” but the mobile phone does not gets switched ON then check ON / OFF Switch. Voltage of ON / OFF Switch must be 2.5 to 3.5 Volt (DC). Clean or change the ON / OFF Switch. Check track of ON / OFF Switch and Jumper if required. If the charging icon is not there then check voltage of ON / OFF Switch. If the voltage is between 2.5 to 3.7 Volts DC, then RELOAD Software in the Phone (Software Flashing). If the phone does not gets switched ON even after reloading software then Heat the C.P.U, Power IC and Flash IC. If there is no voltage on the ON / OFF Switch then check track of the ON / OFF Switch. Jumper if required. If the problem is not solved then heat, Reball or change the Power IC and CPU to fix the problem. Keep the Multimeter on Buzzer Mode and Check +_ and – of the Battery Connector. If there is Buzzer Sound then the Set is short. If there is short at the Battery Connector then clean the PCB with thinner. Heat the PCB. If this does not fix the set dead problem then remove the PFO and check for short. If there is short then replace the PFO. Remove the charging connector and check for shorting. If there is short then change the connector. Remove the charging IC and check for shorting. Change if required. Remove the Bluetooth IC and check for shorting. Replace if required. Remove the Power IC and check for shorting. Replace with a new one if required. Remove the CPU and check for shorting. Replace if required. Remove all the Big Electrolytic Capacitors and check one by one. Replace capacitors if required. Some mobile phones get dead if the RTC (Real Time Clock) is faulty. This happens mostly in China Mobile Phones. Change the RTC to fix the problem. If the mobile phone gets hang after reloading software then change the RTC. If the set is still dead then check by replacing the 26 MHz Crystal Oscillator. Try with another battery. If the problem is still there then there is shorting in the PCB and it needs to be checked. Flashing may solve the problem. Get the Flashing done by any good and experienced technician. my phone(honor 4c) dead and i change my battery and do power on but no power i think my battery and connector and charge ic no problem can you help me what can i do? The Board has to be checked properly. It is not possible for me or anyone to tell the Exact Problem without checking. So, please get the phone checked by some Experienced Technician. sir please,the power button of my itel 1507 is no longer responding,there were a couple of times it did not respond,but after some hours it will start to respond,now it is no longer responding,initially when that problem starts other buttons like the volume were still working fine, now its unable to power,but if i plug it,it will be charging fine. Mere pass swipe elite plus mobile hai, jo 3/4 dino se off tha, aaj main mobile ko on kar raha hoon to mobile on nahi ho raha hai, sirf charging lite glow kar rahi hai, lekin na hi charging show ho rahi hai aur na display on ho rahi hai, phone vibrate bhi nahi kar raha hai, ab main esko kaise repair karu…..
Sir, i bought infinix q8 and is not booting again i was told its a copied android, it will only on and nothing else and i was told it cant be repaired again. RESET the Phone and Flash The Software. It is usually Software issue. Maybe the Technician did not do it properly. Get it checked by Some Experienced and Trusted Technician. I don’t think there is any IC Problem. It can be done by Flashing. Visit some Experienced and well-known Technician. SIR I HAVE SAMSUNG E2152i but mobile repair center says that your phone is dead.There is no chaging at all. Can i repair my dead phone. Battery Connector and Charging IC needs to be Checked. Sir jb se maine mobile repair centre se software update kraya h tb se nhi chl rha h.Ab we bta rhe h kibapka phone dead ho gya h .Kya mera mobile thik ho jayega kya??? Yes. Thik Ho Sakta Hai. The Board has to be checked Properly and the Faulty Part has to be Replaced. I am Nakshatra Meena and my mobile – LYF water 7, Model number – LS-5504. Iski Problem h ki charging k time yeh on hota h keval battery charge k liye jabki switch on nahi ho raha h. to iska kya solution h. iske sabhi button sahi h or mobile bhi thik h. keval charging k time yeh – “android” likha aata h or power button dabaye rakhne per yeh phir always k liye band ho jata h.
There is problem in the Power Section of the Phone. Get it checked. Is the charger working. Try to charge with another charger. Clean the Board Properly with IPA or Alcohol and allow to dry properly. Switch ON. If it works then Fine, otherwise apply Liquid Flux all over the Board and give some Hot Air and again try to switch ON. Yes, there are ways to recover Data in such cases. Get in touch with some good data recovery company at your place. Hello sir, I have a Micromax Canvs 5, but it has irreplacable battery only 5 month old, today while i connected it to a charger then suddenly it got switched off, and then it is not charging, pls help, any home house soln?? My phone (samsung galaxy grand g7105) suddenly got shut down with a white screen gleach. Now its not powering on! Even no download mode or Recovery . Ive checked, the motherbord is not shorted. What can i do in this case? Clean the Board with IPA and Then Apply Liquid Flux and Give Some Heat all over the Board and then Check. If the problem is not solved then the Phone is Dead and needs to be checked Thoroughly. My InFocus m680 nit booted up. It switched on and hanged up in yu icon. When it hangs in the yu icon the Qualcomm processor is heating up. I tried to flash the mobile using new software, but it gets some error in the starting of the flash process. After doing such things now the Mobile not booting. When switched on it just the screen is black and showing failed to load image. What may be the problem. Is the memory chip has been damaged or the Qualcomm processor,or any some other issue. Please give me some solution…when I try to load flash it..it worked till 70% but after that it show some error..
Could be shorting somewhere on the Board. This looks like Software Problem. Get the Software Flashed by some Experienced Technician. Hi Das sir, your all solutions are so impressive. I have also a query I am using REDMI NOTE 3 (32 GB), I was doing charging of my phone via MI 10000 MH power bank and suddenly didn’t know what happened, charging stopped. Maybe there is shorting somewhere in the the PCB. Get it checked Outside by some experienced Technician. They will Clean the PCB with IPA and Flux and apply Hot Air. This might solve the problem. Check the battery connector. There is some kind of shorting. Get the shorting fixed. You may have to change the battery connector. While changing the Touch Pad and SIM Slot, maybe you made some mistake and either the Track is Damaged somewhere or there is some shorting somewhere. Hello, I have got a moto g2 xt1068. It is water damaged and isn’t getting start nor responds to charger. Got it a chemical wash/dip from a local shop. He returned the phone saying board has short. Now what should be done?? Apply IPA and Flux all over the Board and then Give Heat using Hot Air Blower. If the problem is not solved then the SHORTING has to be checked and the component has to be replaced. Any good experienced technician will be able to do it. Thank you sir, will follow up.. PLease explain your problem in some detail. I don’t under stand your Question. Outo Connect? If the Battery Removable. If Yes, the BOOST the Battery Using Battery Booster and then Charge it. Also try to switch ON the Tab with a DC Power Supply. For all this, you might have to carry the Tab to some good technician. Thanks. Please SHARE with others so that they can also learn. Did you try with another Charger? If yes, then maybe you have to change the charging connector. Do you power the board with a DC Power Supply or you just plug in Charger? You can Power it with Battery or DC Power Supply. Im very interested in your article above since my focus is on getting dead phone working again. I have a little repair shop and its always been a challenge to revive dead phones. So far i understand how to fix shorting but my struggle is when a phone has no short. Right now i followed up with a device which has no short and the 0n / Off switch is giving me readings more than 800 to 1100 on multimeter pls advice. Sir , is this battery issue? You need to reinstall the OS. Get it done by some good technician. Disassemble the Phone and clean all the parts including the PCB with Alcohol or Petrol or IPA and allow to Dry. Assemble back and check. `phone suddenly went bad can not on , when try to charge the phone only the indicator do show red light. what do i do as i love the phone MACROMAX. REPLY PLS. Please tell me your oppinion. On a continuity test + on + and – on – i get 1 and for + on – and – on + i get aproximately 270. Do you think this might be shorted? There is no charge nor power on. No Charge? No Power? Did you check the battery? Replace the battery and Recheck. Boost the Battery using Battery Booster or try to switch ON the Phone using DC Power Supply. If it doesnt switch ON then you will have to change the PCB. My tecno swich off randomly and wont turn on unless removing n inserting da battry again then it power on n went off imidiatly repair shop told me board have to replaced i wanna know what could be the fault. I drop it befor plz help n sorry for ma english…..
Clean the whole PCB with IPA / Alcohol / Flux. Replece the battery and check or replace the charging connector. Thanks for good sages . Plzzz suggest me the solution for this problem. Thanks sir, I luv ur work and hope u do more. But sir can I get any vital tips to tackling power problems on smartphones? Also what materials can I consult to get more useful knowledge to fixing mobile phones based on precision and standard methods. Hi sir my samsung galaxy s6 turned off while i was playing game and is not turning on what is the issue? Reset Using the Power Key and Volume Key and Update the Software. My samsung galaxy note 3 sm n900 is dead since last year and i left the as it was.. But now m trying to fix it.ive checked the motherboard with multimeter it has no shorts components seems good battery is good but still it doesnt gets on.. Could u plz share wat is the reason behing it.. Or what shud i do to bring my phone back to life.. It need proper servicing at the service center. Bhai jab se hamne apne phone HTC820q Ka boot ic bdlwaya h tab se phone hiting ar battery prablom ho gaya h.
I have Micromax Q413 which has battery backup issue. Battery dose not persist for more than 24 hrs. My Motorola G 4 plus mobile is dead. The mobile is not charging up neither switching on.The service center guy says the mother board is shorted and cant be repaired. So he is saying to get the motherboard replaced. Please suggest? Hi sir. My inifinix note 3 turns out dead after I sleep on it. When I wake up, it was hot and doesnt turn on. I tried it on laptop, using flash tool, but it was not detected. What could have possibly go wrong with my phone? repair person say its dead.motherboard has to be replaced. Changing the Whole Motherboard is the easiest way to Repair any electrical device. It is difficult for me to tell about THIS Fault without checking the Phone. So, Please get the Phone Checked by some other REPUTED Technician in your Area. Your phone needs flashing or Software Update. Get it done at any repairing center. Can you reload / update the Software. what could it be sir, when you charged a phone but after charging, it failed to Power on. There could be some issue with the Battery Connector. Change the charger and check. Is the charging connector properly replaced? Samsung galaxy s duos 2 display white problem repairing solution. If the phone is in warranty then go to the Samsung authorized service center and get the display replaced Free of Cost. Otherwise, you will have to change the display. wonderful power. you are very smart in what u do sir. keep me aware of any other related post.